I've been sitting in on the principles of micro- and macro-economics classes, which has been a lot of fun. But one thing has been bothering me: the justification seems weak for the assertion that market (and aggregate) supply functions are upward sloping. It makes intuitive sense to just say that if the price of a good (or service) rises, the producers of that good will produce more. But four years of economics has trained me not to trust my naive intuition. Instead, I want to set up a model and see what happens in that model. Then I want to carefully consider the relationship of reality to the model's assumptions. Next, we lower (raise) permanent tax rates so that in general, demand increases (decreases) due to income effects. Not all firms will experience the same effects. Some firms (those making normal goods, which have positive income elasticity) will see demand rise (fall); some firms (those making inferior goods) will see demand fall (rise), and some (those making goods with highly income-inelastic demand) will see little change in demand. Since most goods are normal, with income-elastic demand, we'll focus on the first category. In the short run, these firms experience the following, with D' being the new demand curve with lower tax rates, and D" the new curve with higher rates. So, yes: quantity supplied increases (decreases) when the price increases (decreases). 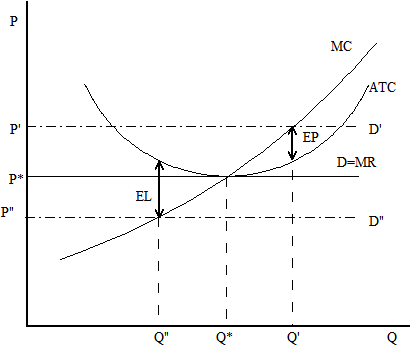 When prices increase, the firms make a short-run economic profit (labeled EP on the graph); when prices fall, firms experience a short-run economic loss. Let me take a moment to check my assumptions. Perfect Competition: The same behavior holds for monopoly and monopolistic competition with rising marginal costs (and all but the most rigidly doctrinaire Libertarian economist will admit that monopolies with falling marginal costs should be regulated by the government), so this is a useful simplifying assumption. Maximum Efficient Scale: Not relevant in the short run. No Starting Economic Profit: Usually realistic per se. Mostly Normal Goods: Usually realistic per se. The only dodgy assumption is the upward-sloping marginal cost curve. 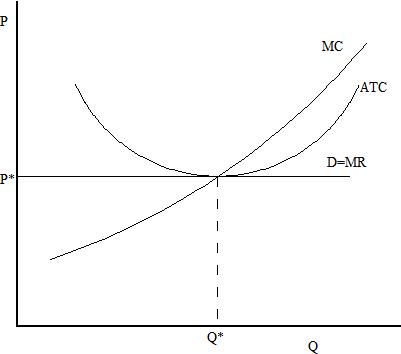 Because I'm investigating why market supply curves are upward sloping, assuming that marginal costs curves are upward sloping is to implicitly assume the consequent. I want an independent justification. Given that I'm analyzing the short run, we can increase only one factor of production, and labor is the easiest factor to change. So, firms need to pay their existing workers overtime to produce more (obviously increasing marginal costs), or they need to hire more temporary workers (in the short run, firms do not want to commit to a long-run increase in their permanent workforce). Temporary workers are more expensive and less productive, so marginal costs will increase. So I think this assumption is supportable. However, economists assert that the upward sloping market supply curve is a long run curve, so we need to figure out what happens not just in the short run, but in the long run. That will be the topic of the next post.